It’s not often that we get to take the game of foosball seriously anymore. As many carefree teenagers do, we went through a two month love affair with the table-top sport during our heady college days. But our dreams of a glittering professional career were promptly quashed when we were informed by our haughty peers that we had an exam on A Midsummer Night’s Dream rapidly approaching. In hindsight, it was probably a good thing that we traded our tungsten twisting obsessions for Titania’s illicit romp with a donkey – after all, if we hadn’t passed that test, we wouldn’t have had an excuse to play Foosball 2012 during work hours. Everything happens for a reason, so they say. In truth, it's a funny game – and not in the desperately dreary Shakespearian comedy sense. 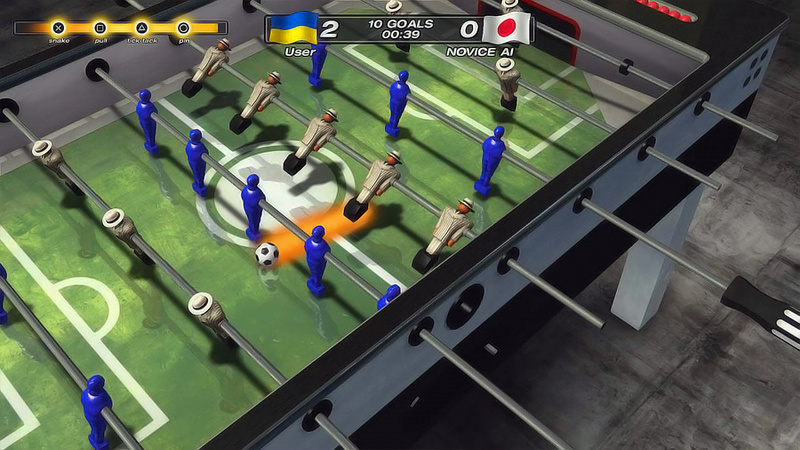 With no immediate reference point, the Grip Games-developed PS3 and Vita exclusive is something of an anomaly that, considering the popularity of table football, is bizarrely breaking new ground. The mechanics of the game should need no introduction to anyone that’s stepped foot inside a youth centre over the past 30 years: you control four racks of foos players, with the objective of sliding and twisting bars to knock carefully controlled ping-pong balls into your opponent’s open net. Of course, given the control limitations of PS3 and Vita, Grip Games has been forced to get creative with its input system. As opposed to operating the movement of the players, you’re given Marble Madness-esque control over the ball when it’s under your team’s possession. Budging the ball forces the game to automatically finesse your players into position, allowing you to dribble the spherical object into the area you want to occupy. If it sounds backwards, well, it is – but the system is actually brilliantly conceived, and it allows even casual players to enjoy the sport’s otherwise intricate gameplay. Once you’ve lined up the ball, stabbing the right stick in a given direction allows you to fire it towards goal. As an alternative, when you’re playing on the Vita, you can swipe the touch screen to achieve the same effect. Both of these inputs result in bog-standard attempts, but there are a handful of trick shots on offer too. These can be executed by pressing any of the DualShock 3 or Vita’s face buttons when a meter is fully recharged. Frustratingly, you need to unlock these power-ups by playing through the single player campaign – but they can also be purchased via the PlayStation Store. We haven’t got a problem with the model, but it feels like such a core element of the gameplay should be unlocked from the offset. Perhaps the developer should have focused on cosmetic features if it needed to include DLC at launch. 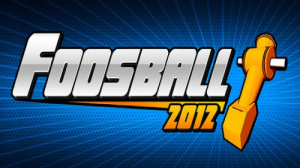 Regardless, it’s hard to get too frustrated when Foosball 2012 already represents such outstanding value. For a single fee you unlock both the PS3 and Vita versions of the game, both of which are augmented with cross-play functionality that allows you to transport your progress on the go with minimum effort. While this isn’t the first time that the feature’s been implemented, it’s no less impressive – and it works as flawlessly here as a first-party title. The cross-play mechanics don’t end there either, with the game boasting a fully merged online community. Regardless of which system you’re playing on, you can compete against opponents on the opposite platform. It’s the kind of revolutionary multiplayer feature that feels like the future of handheld gaming. 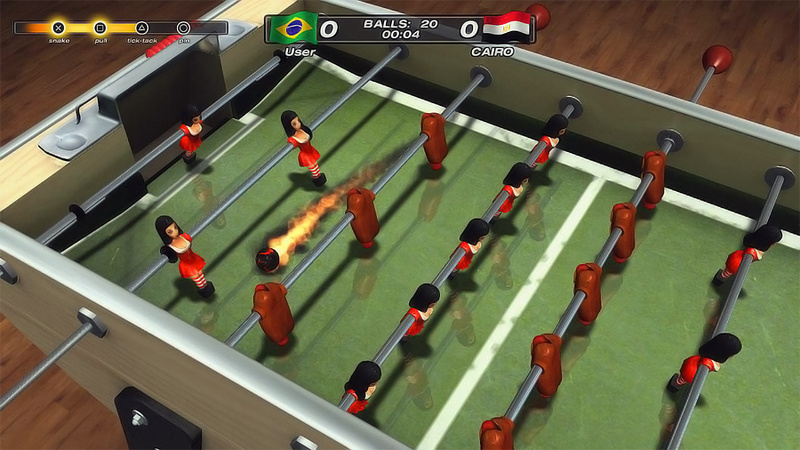 The online multiplayer in Foosball 2012 is actually fairly impressive, too. The game boasts a full persistent upgrade system, allowing you to level up as you compete in matches and unlock bonuses. The developer’s managed to cope with lag reasonably well, but issues do still persist. There were occasions during all of our matches where we watched the ball roll into our opponent’s net, only for the goal to be discounted and the ball magically transported back to the middle of the table. Grip Games has informed us that it’s working on a patch to resolve this issue, so let’s hope that it’s introduced soon. Connectivity issues aside, though, the technology is impressive. Matchmaking is incredibly snappy, and the game never stops to load. 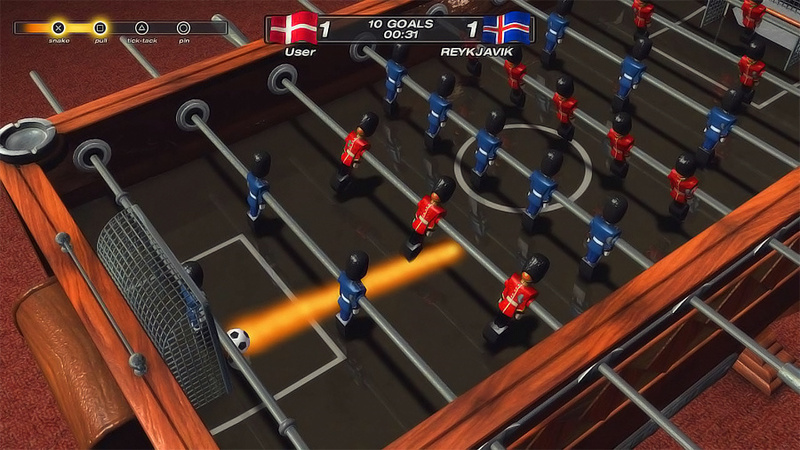 Considering this is Grip Games’ first foray into full console development, Foosball 2012 is a surprisingly competent package. Its quality PlayStation Move implementation is similarly unexpected. Here the automated control of the analogue stick is replaced by the unnerving accuracy of Sony’s motion controller. When playing with the device, the game comes much closer to representing a full simulation. You need to wiggle your players around the ball in order to control it, which makes the gameplay significantly more challenging. But while it’s tough, it’s a fun alternative, and the ability to use two Move controllers at once makes the experience much more akin to playing on a real foosball table. 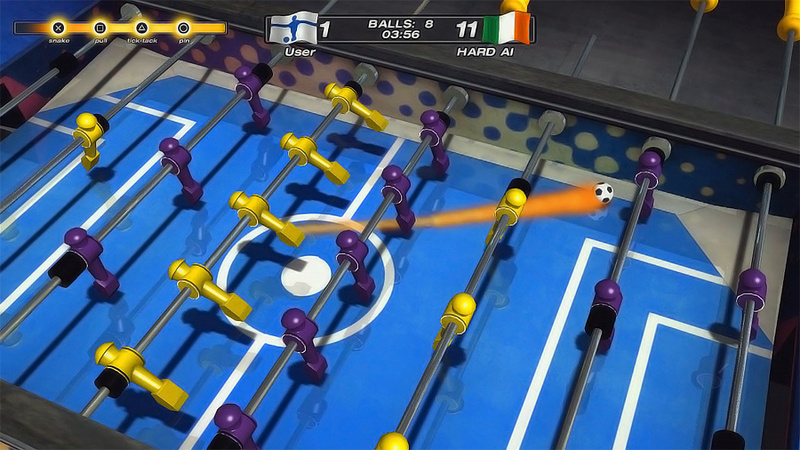 Outside of the online and local multiplayer modes, Foosball 2012 also boasts a full single-player component. The title eschews the razzmatazz of other sports game campaigns in favour of an unassuming jaunt around the world. You play against increasingly difficult national teams in a variety of different match types, with the reward for completing each level a new cosmetic or gameplay upgrade and a handful of stars. Some of these stages get a little too tough for our tastes, but the rewards will push you to retry – after all, who doesn’t want to play with hot dog foos? Visually the game is unspectacular but solid. It runs at an unwavering 60 frames-per-second on both PS3 and Vita, and features some unique visuals effects thanks to the inclusion of a handful of imaginary balls. There’s a wealth of tables to perform on too, spanning futuristic layouts to more traditional designs. Sadly, the title’s mix of dreary rock music and hip hop beats fail to match the quality of the graphical presentation. 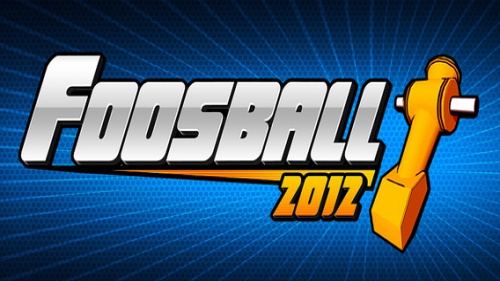 Foosball 2012 was never going to set the world alight, but it’s a competent arcade multiplayer game that’s a great fit for parties or social gatherings. Despite its misjudged micro-transactions, the game still represents outstanding value, and the impressive connectivity between the PS3 and Vita versions helps to accentuate that. 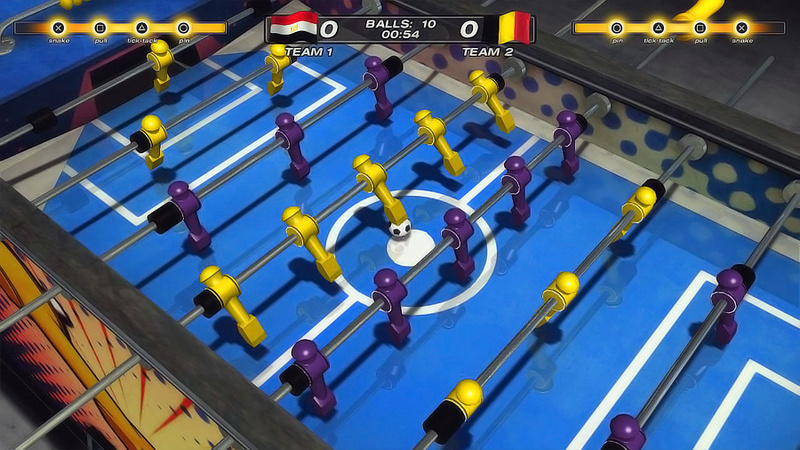 The title’s unlikely to hold your attention for too long, but if you’re looking for something lighthearted and fun, Foosball 2012 is well worth a spin. interesting that they're looking to add a patch for multiplayer lag. Reports of that is actually what made me hold off from buying it. @Squiggle55 We've got an interview coming up with Grip Games that tackles this topic. The lag isn't hugely problematic in my experience, though. Obviously it's there, but it doesn't break the game.